My song selection "Gonna Get Close to You" was not overwhelmingly appreciated by most of the voters on that post. In fact some of you disliked the song so much you didn't bother to vote. I still think it's a pretty fine song and both versions were quite good to me. Votes for Queensryche outnumbered those for Dalbello two to one with the former receiving ten and the Lady Dalbello receiving five including my own. My thought is that the votes that came in were primarily due to the familiarity with the group, but also perhaps only a cursory listening to Dalbello's take with a negative opinion formulated early on. Personally I think Queensryche does a fine heavy metal take on the song and they deliver what their fans were expecting. They recognized a good song that they could adapt to their style, but it's merely another heavy metal song styling by an exceptional group in the genre. On the other hand, the composer Lisa Dalbello turns the song into a mini-drama delivered with so much feeling that the essence of the song is much stronger than the cover version. Lisa's take has nuance and variety that I think makes her version far more interesting. From the initial sound of the ticking clock and the ominous cascading synthesizer to the screaming guitars and threatening drums, the overall production quality of her version is far superior to the Queensryche cover. If you think we're wrong then go back and listen again very closely and I think you might hear what we observed. Then again I don't think most of you care for the genre and will probably not want to subject your ears and head to the experience. In my opinion Lisa Dalbello is a fantastic songwriter and performer. The cassette tapes that I owned of her music were played repeatedly when I was on the road and I hold a fondness for her music. She was a favorite artist of mine in the 80's. Queensryche 10 votes to Lisa Dalbello's 5. 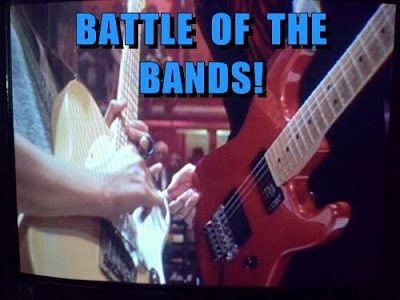 Next Battle of the Bands is Saturday February 15th. Someone sent me an email with this clip and I thought I'd share with the guitar fans out there. Maybe you've heard the guy. If not check him out and see what you think. If you listened to the guitarist, what did you think? Do you like music that is highly dramatized? If you voted for Queensryche do you think you were prejudiced by being more familiar with their music or style of presentation? Music to Relax, Queensryche, "I Will Remember"
I think all musicians have their own personalities and there has always has to be a winner and loser. Sorry, Queensryche still wins for me. Heard of Tonne. He makes it look so easy, doesn't he? I need to send you a John Petrucci clip that will blow your mind. >>... If you voted for Queensryche do you think you were prejudiced by being more familiar with their music or style of presentation? Actually, I'm not sure that I had EVER heard any of their... "music"... before. I voted for them because they were the lesser of two very great evils. Great guitarist. Reminds me of Paco de Lucia. But at the 5:00 mark, when he was playing something I REALLY wanted to see [How's he making that sound, exactly? ], where was the photographer's focus? On a couple chicks sitting in the audience, listening and bobbing their heads. Sheesh! I love a passionette performer. I really have to go with STM on this one, despite the fact I believe he said something about not listening very much to Lisa. I made it through most of each... just made me uncomfortable, she did. Thanks for that guitar virtuoso, really enjoyed that. I've never heard him before, but I could listen to that music for hours. I also like Spanish guitar and gypsy jazz. As for the BOTBs, I'm not much for heavy metal, you're right. Yvonne -- And we all have favorites and preferences. Alex -- I didn't think I could sway your preference. StMc -- I don't know about "very great evils". What was the evil of the music? The song was a dramatic character study the way I see it and depicted types of people who might be considered evil or misguided, but it was not much different than a book or movie of a similar nature. I guess they had to put some crowd shots in the video and chicks work well to fill that bill. Shelly -- A passionate performer especially when they're good at what they are performing. CW -- Check out some of her other music. She's good. She's also an actress and her drama carries over into her music. DG -- I wouldn't call Dalbello heavy metal as much as 80's whatever style you call it. She reminds me of David Bowie during that era. Since I don't listen to heavy metal, the song was NEW to me, Lee, and I still voted for Queensryche. I don't know if that clears things up or makes it more muddy. Make no mistake, my vote for Queensryche was simply my desire to follow the rules and vote for someone, and they seemed to be the lesser of two evils. Before we go too far on defining what is evil and what is not let me give you my opinion (you had no doubt that I would, did ya?). In this case, anything that causes me to cover my ears and shake my head, while my eyes are rolling back into my skull - OK that's a bit over dramatic, but you know me. I'm not sure I have ever heard Queensryche or Lisa Debello before this, but I sure hope I don't hear either again. To say neither was 'my cup of tea' is the understatement of the century, but to each his own. I have to admit that I must be reaching the age my daddy was when he called the music of my generation 'noise', cause that's the kindest way I can describe this particular BATTLE. All that said (and I hope you take it in the spirit of fun that it's intended) what a wonderful world that we don't all like exactly the same thing - I think. Now let's talk about Estas Tonne, that was music - at least to my ears. He wasn't too bad to look at either, in that scruffy, avant-garde musician kinda way. Sorry I missed the vote. I grew up listening to Queensryche and the like, but then live in Latin America for a few years and really learned to love others kinds of music. My music tastes now are all over the place, from heavy metal to electronica to acid jazz and funk, so I can appreciate both songs for what they are. The guitar solo was entertaining, and I agree that passion combined with skill makes for the best performances out there (which is what I hate about most pop music).